Mileposts magazine, issue Volume 1 Number 1. This A5-size magazine hit the newsagents in the Summer of 1946. Edited by Dudley Noble, Mileposts was intended to appeal to motorists itching to return their motor-cars to the road, many of these cars having spent the war years sat on blocks, waiting for peace to return (hopefully). It was a quarterly publication, costing 1 shilling (5p), and published by The Simble Publishing Company Ltd of Fleet St, London. An annual subscription was available, costing 5 shillings (ie more than 4x the cover price, but it did include postage). 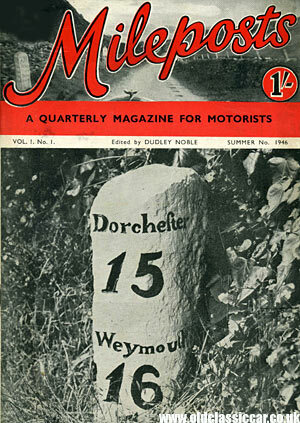 Despite the magazine's title, and the cover showing an old milepost located 15 miles from Dorchester, it wasn't a milepost-appreciation magazine. Instead it was intended to open war-weary motorists' eyes to the joys of the open road, describing interesting and worthwhile car journeys, both in the UK and abroad. It did assume that your car was actually up to the task of lengthy car journeys, and that fuel for such jollies would be readily available. However anything that hinted at a rosy future, when optimism was still in fairly short supply and times were decidedly tough, would have had a warm reception in most households. The magazine kicks off with an advertisement for Smiths Motor Accessories, and then the 1946-season Hillman Minx - "a smooth running safe-cornering car" we're told. Then it's down to business, with the editor introducing the magazine, and outlining the idea behind its launch ... "The name has been chosen with careful thought. There is a lure about mileposts - they smack of the romantic; they convey the thrill of the open road. They conjure up long vistas with the purple haze of distant mountains; the road along which we travel hopefully". In addition to Hillman, a number of other car manufacturers were gearing up for production once more, and advertised their products in this, the first edition of Mileposts. 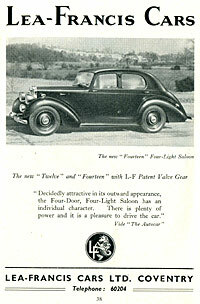 Lea-Francis had a full page advert for their new "Fourteen" four-light saloon, shown on the right. Both the "12" and the "14" featured L-F patent valve gear we're told, and The Autocar was quoted as saying that the car was "Decidedly attractive in its outward appearance, the Four Door Four Light Saloon has an individual character. There is plenty of power and it is a pleasure to drive the car". It would seem that the buying public was less enthusiastic however, with only 2,133 examples eventually being sold during eight years of production, the model disappearing from the pricelists in 1954. Other interesting ads for India & Dunlop road tyres, Standard Cars (featuring the postwar Eight and Twelve), and the pre-war inspired Wolseley Eight featured in its pages. For £360 plus Purchase Tax of a whopping £100.15.0 you could buy yourself a new Wolseley Eight, assuming that you could actually find one for sale in the UK market. It was a smart looking motorcar, by this time a product of the Nuffield Organisation and sharing much with its Morris stablemates. 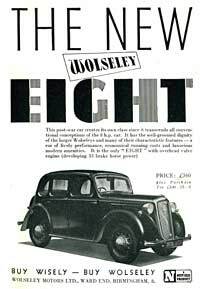 The reader was told that the 8 ".. has the well-groomed dignity of the larger Wolseleys and many of their characteristic features - a car of lively performance, economical running costs and luxurious modern amenities. It is the only "EIGHT" with overhead valve engine (developing 33 brake horse power)". Page 50 advertises Britain's Motor Industry Jubilee Year, which was to be a celebration of the British motor industry held throughout the summer. Whereas now, a celebration of the British-owned mass motor industry could be held in the average back garden, in the late 1940s there were still plenty of British motor manufacturers to be proud of. Although many marques fell by the wayside, or were swallowed up by larger concerns, during the '20s and '30s, many old favourites were still in business and British owned at this time - Austin, Morris, Hillman, Humber, Daimler, Lanchester, Standard, Triumph, Vauxhall, Wolseley and Rolls-Royce were just some of the makers still in business, and keen to prise open your wallet. A giant display to be held in London's Regent's Park was planned, as were provincial cavalcades in cities across the land. But back to the magazine's raison d'être, that of planning and executing motoring trips. The first tale recounts the adventures of three adventurous chaps as they embark on a trip to France, in an unidentified motor-car. Plenty of the article is given over to gastronomic experimentation, with delicacies such as snails, frogs' legs, guinea-fowl and blue trout passing over their plates as the tour progressed. To a reader back home, perhaps more used to dried egg and corned beef in recent years, this must have seemed like very exotic fayre indeed. The first Benz of 1895. Following on from this Continental expedition, a lengthy look at some of the key milestones in motoring history, starting with Karl Benz and Max Rose in 1895. The duo demonstrated their first self-propelled vehicle in Mannheim at a public display, cheered on by local townfolk and their relatives. The vehicle was assembled at the gas-engine works of Benz et Cie, Rheinische Gasmotorenfabrik, during Benz' spare time. The plan had been to give a gentle demonstration of their new machine's capabilities outside the factory, however it didn't quite go to plan, according to this article, and led to what must have been the first car accident of its kind. Both Benz and his wife Berta were unhurt, although the former's good lady did become a little tearful as Mr Benz looked over the sadly bent horseless carriage. The car, as it was, featured a hand starter. With the crowd looking on, instruction from on board the car was given for an assistant to swing the engine over. Despite several gallant attempts, the engine wouldn't fire. So Benz decided that a push start was required, and several hefty chaps came forward and gave the car a shove. On the plus side, the engine kicked into life and the demonstration could begin - on the downside, the pushers had failed to notice a nearby wall, and sadly the contraption ploughed forward and into the brickwork it went, bending the car too badly for a repeat attempt. A week or so after this day, with the car repaired, Herr Benz and his wife did indeed demonstrate their amazing machine, to the approval of an excited crowd. The beginning of Rolls and Royce. Other motor milestones covered in the magazine include the first motor show, held at the Imperial Institute, South Kensington, in May 1896, and how C.S. Rolls and F. Royce got together to produce their eponymous motor-car factory. It also recalls how Charles Rolls became interested in the fledgling aviation world, which increased markedly after accepting the offer of a flight with Wilbur Wright, early in 1910. So much did he enjoy the experience that he ordered a Wright Flyer aircraft for himself, in which he practiced the mechanics of flight. However, his enjoyment of flying would come to an abrupt end on July 10th, while taking part in an aviation meeting in Bournemouth. The aim was to land your aeroplane within a specific 'box' on the ground. Approaching from the wrong angle, Rolls over-corrected and pushed the aircraft beyond its structural limits. The plane broke up and sadly ploughed into terra firma, its pilot standing no chance of survival. The magazine then tells of an exciting trip to the Sahara by motor-car, a large 24hp model as yet to be launched, and readied for tests in the punishing desert environment. It carried five people, their equipment, and a caravan hitched to the rear. Their route took the car and team across the Channel to France, down to Marseilles where a boat took the ensemble to Algiers in North Africa. Several pages are given over to the trip, I think undertaken in the previous decade, and despite the car's strong performance, no mention is given of it's make. Only one photo, of a chap sat behind the car's steering wheel, shows the car at all, with no sign of the caravan used. The thing is, most cars dragged out of long-term storage in the mid/late 1940s, would have struggled to reach the next town, let alone successfully traverse distant continents. With these motorists and cars in mind, the magazine goes on to look at areas you might like to consider visiting, a little closer to home. A leisurely trip on the roads of Staffordshire is recounted, with interesting places to visit, and sights to see, mentioned as the trip unfolded. Then it was very much a county of two halves, as the article discusses, contrasting the pottery kilns, slag heaps and dingy canals of the Black Country, with the green spaces of the Trent Valley, Tamworth, Lichfield (with its cathedral) and smaller villages around and about. Despite its small size and lack of in-depth car articles, it's actually a very good read. I'm not sure how many seasons the magazine ran for, but if anyone can shed any light on what became of the Mileposts magazine, please drop me a line. Return to the car magazines section, where various older magazines from the UK and abroad are featured.